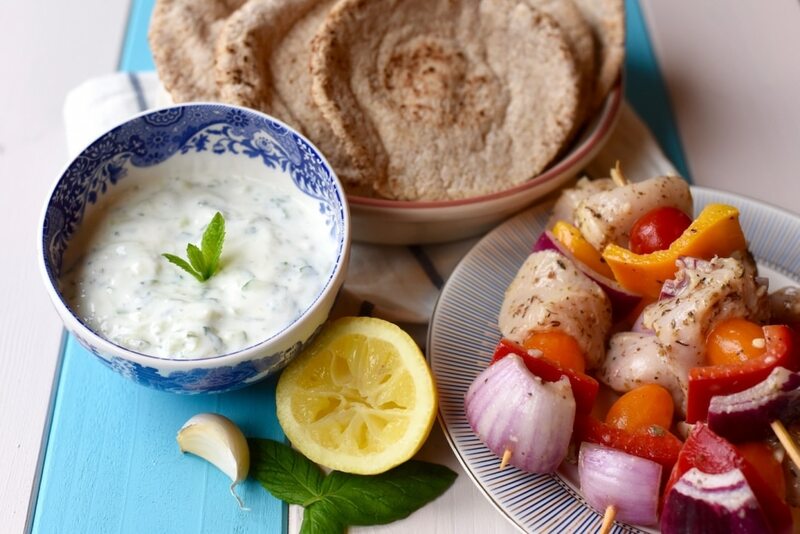 Transport yourself to a beautiful Greek island with these really simple Greek Chicken Skewers. Bursting with lemon, garlic and oregano flavours, yet low in calories, they are a real crowd pleaser! You will always find skewers at a BBQ, well at our BBQs you will anyway, but that doesn’t mean they should only be made in the summer. 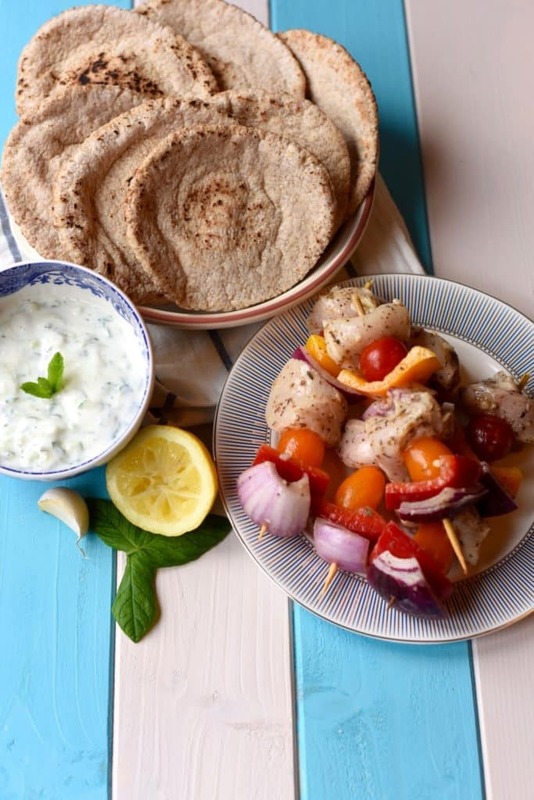 When we have people over for dinner and we don’t have a lot of time to spend in the kitchen, we make some kind of skewer and these Greek Chicken Skewers have become a favourite. Our 3 week island hopping trip around Greece last year was a bit of a culinary adventure. We ate so much incredible food and as often as we could we would try to get the recipe out of them and they were usually willing to share. In a lovely little harbour-side restaurant in Mykonos, with a spectacular sunset view, we ordered some Greek chicken skewers. Initially, when they were served, we were a little bit disappointed because they didn’t look very special, but after one bite everything changed. They didn’t need to look very special, because it was all in the marinade. A generous amount of olive oil, lemon juice, garlic and oregano brought these little chicken chunks to life. We have added some veggies to ours, just because any extra vegetables in our diet is a good things. We used bell peppers, red onion and cherry tomatoes, but many other veg work well, as does halloumi cheese. One thing that was consistent in all the recipes that we brought back with us from our favourite restaurants was the liberal use of olive oil. It is key in a Mediterranean diet and despite it being high in fat, they are some of the healthiest people in the world. Here at Hungry Healthy Happy we definitely don’t fear healthy fats; rather we encourage people to include them in their diets. Olive oil is high in monounsaturated fatty acids, which is considered healthier than trans-fats and saturated fats. Greek people consume the highest amounts of olive oil per capita and due to this they are some of the healthiest people in the world with one of the longest life expectancies. Even more reason to make sure it is part of your diet! It can also reduce your risk of type 2 diabetes, can prevent strokes, keep your heart young and reduce depression. “This January, 31 London restaurants will participate in the European extra virgin olive oil weeks initiative: an event to be savoured, which aims to whet the appetite of British consumers. There will be no lack of gastronomic ideas: each participating restaurant will recommend a dish for enhancing the product and will have dedicated personnel on hand for information on the theme.” You can see the participating restaurants below. Whilst we love cooking with olive oil and drizzling it over salads for a dressing, there is so much that you can do with it. You can use it as a conditioner, on your skin, and even as furniture polish. Do you have a wooden chopping board? Rub olive oil into it every few months and it will last you a lifetime. Think of some of the best cuisine in the world, Greek, Spanish, Italian, French – they all use a lot of olive oil. That has to say something! We are big on making our own marinades in our house, as they are so easy to make and they don’t have all the sugar and salt added to them that store bought ones seem to. 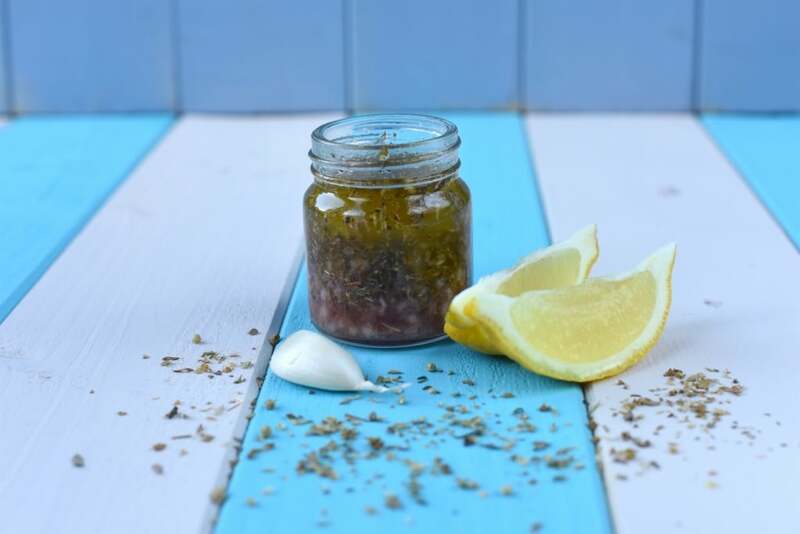 Just smell this marinade when you’ve made it – it is wonderful! I think I have made myself miss Greece even more than I already do with this post and reminiscing about Mykonos. If you haven’t been, then put it on your wish-list. It’s much nicer, and quieter than Santorini in my opinion (even though it has a party reputation). I might have to make us a bit of a Greek feast this weekend to reminisce even more, so expect some more Greek recipes on the blog soon. 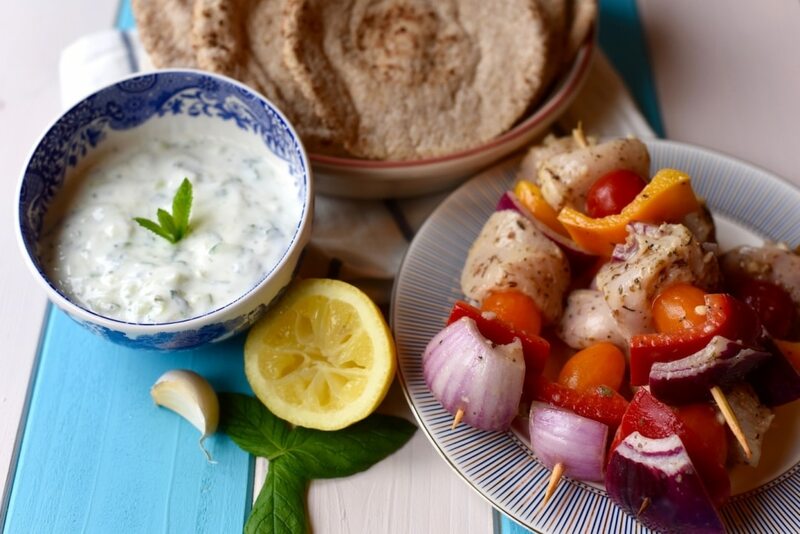 We served these Greek Chicken Skewers with some homemade tzatziki (the recipe for that is coming soon) and some homemade pita breads (recipe for that also coming soon). We also baked some potato wedges as we are a little bit obsessed with homemade wedges at the moment and experimenting with different seasonings – more on that soon! You can also leave the chicken out and replace it with chunks of mushroom and keep the skewers vegan, which is what Dannii did. There is enough flavour from the olive oil, lemon, garlic and oregano so that they aren’t missing the meat. These will definitely be going on the BBQ when the weather heats up too. Come on summer, we are ready for you! 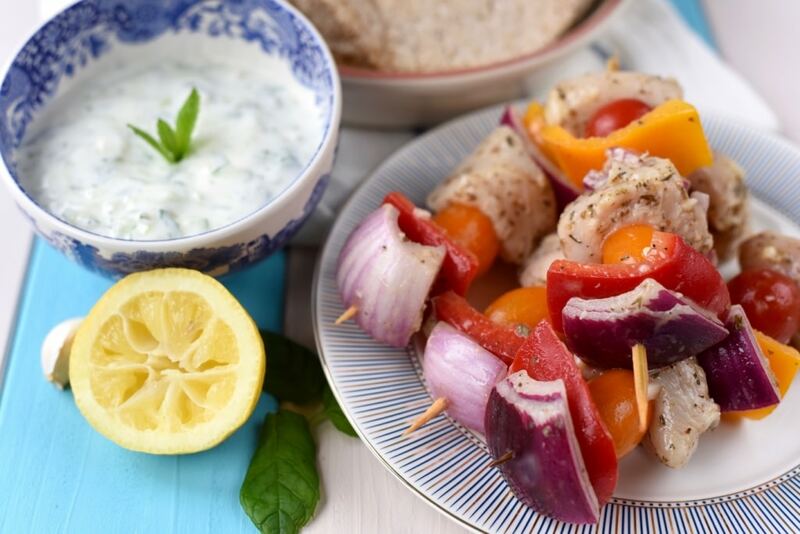 Bursting with lemon, garlic and oregano flavours, yet low in calories, these Greek Chicken Skewers are a real crowd pleaser! If using wooden skewers, soak in water for at least 30 minutes before using. Put all of the marinade ingredients into a bowl and whisk together. Put the diced chicken and vegetables into a sealable bag and pour in the marinade. Seal the bag and mix it all together. Place in the fridge for 30 minutes. Thread the skewers with the chicken, tomato, pepper and onion. Cook the skewers, turning occasionally, in a preheated oven at 200°C for 30 minutes or until the chicken is cooked through. We love chicken marinated in lemon and oil like this and your marinade sounds so good. Can’t wait to try your spin on it! 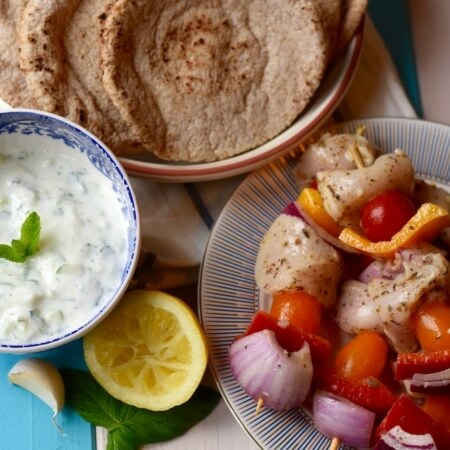 Loving the Greek flavours on these skewers. The chicken looks so juicy. I can’t wait for grilling season to fire up here. Easy, delicious dinners….gotta love it!! I love the sound of this simple marinade! Now if you’ll excuse me, I’m going to close my eyes and transport myself to Greece. Hopefully I can visit Greece someday. Your photos are gorgeous! These skewers sound so good. Love that marinade and the addition of the veggies. These look and sound so good and are making me excited to get my grill back up and running! Those pictures from Greece are stunning…must’ve been an amazing trip! A delicious meal, with lovely combination of ingredients. A good olive oil makes all the difference with flavour. We love paneer skewers and make them in the grill in the winter , nothing like bringing the feel of a barbecue in doors in the winter. Your recipe looks great. Love these. I’m such a big fan of olives, hummus and chicken. I don’t tend to put much olive oil on my salads but when I do it always tastes that much better. Where would we be without olive oil? 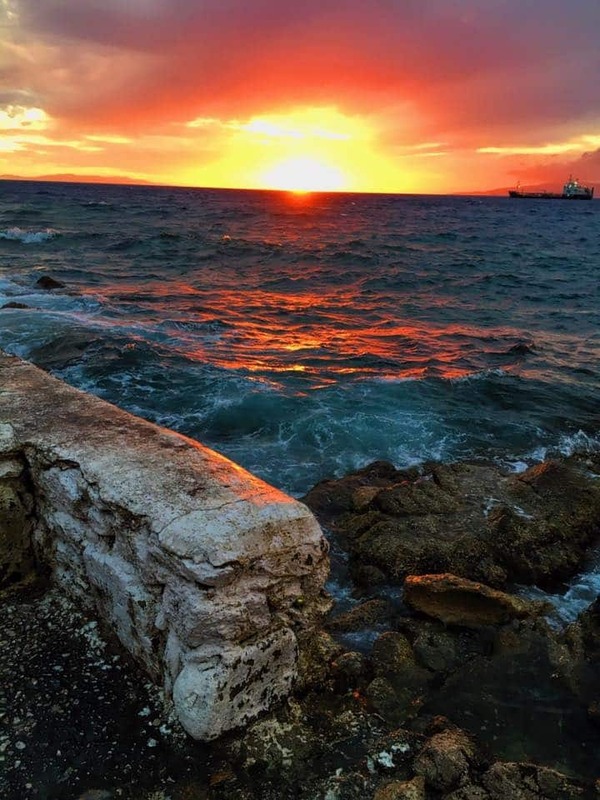 It’s wonderful stuff and so is Greek food AND so is that sunset – wow! My husband and I love Mykonos. I will have to make this recipe to recreate our travels. It looks delicious! I have a recipe for Greek Pesto Chicken Skewers. I can’t wait to try your sauce on and switch it up a bit! These look great, and your sauce sounds delicious! Mmm, these sound so good with all that garlic and oregano! And I am a big believer in using LOTS of olive oil in my cooking. I don’t know what is up with this trend I keep seeing (mostly on youtube) of people sauteing veggies in a bit of water because they don’t want ANY FAT in their food. What the…? Don’t they know fat is good for people?! Our brains literally NEED FAT to function, and healthy fats like olive oil are one of the best ways to help our bodies thrive. So happy to see so many bloggers promoting the benefits of healthy olive oil with the European olive oil initiative. Thanks for spreading the word, and of course, for this delicious recipe! 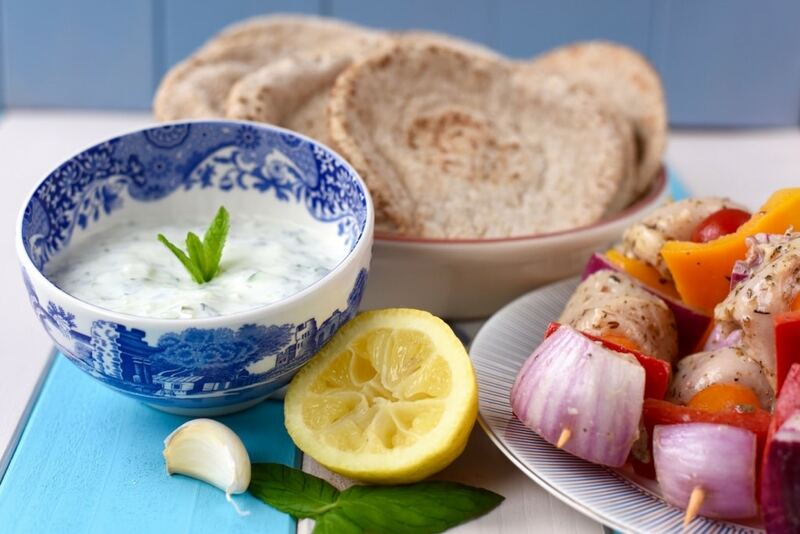 I can’t wait for that tzatziki sauce… I’ll slather that stuff on anything!